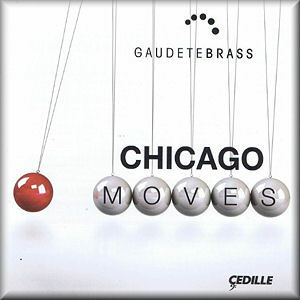 The Gaudete Brass are a Chicago-based brass quintet, and this is an outstanding recital album of new music inspired by their hometown … and, mostly, commissioned by the players. If you want to hear the latest in brass music you need to hear this release for its variety and the quality of its writing and playing. James Woodward’s fanfare Gaudete, which opens the program, is cited in the booklet for its consciously ‘American’ feel, and that is true: there’s a bit of Copland-style wide-open space, and maybe a faint echo of the theme music for TV news shows. John Cheetham’s sonata is a compact and wonderful piece; the first movement sports a theme which sounds a little like a deleted scene from a Shostakovich ballet, passed skillfully from player to player, while the central andante is a lyrical gem featuring a melody for the trombone. If you’re afraid of contemporary music because it lacks melody, this is something for you to hear. We’re told that the three sections of Brian Baxter’s A Great Commercial City represent “boldness, independence, and strength.” I couldn’t tell you which is which, but this piece is more textural, layering ideas on top of one another and occasionally featuring an Ivesian tune-in-the-distance effect. Helios, by Stacy Garrop, represents the sun god himself, not a sunrise or anything like that. The elegiac second half, with magical effects made by simple chords and instrumental combinations, is especially noteworthy here. Rob Deemer’s piece Brass may be the most plainly-titled work ever written for brass. I wonder if he also has a work for orchestra called Orchestra and a sonata called Piano. But I ended up loving Brass: the first movement, “Bell,” is what it says on the tin, with an interesting flavor of hymns and sacred music. No surprise what equipment the performers use in “Mute,” but maybe the chorale-like texture and slight suggestion of medieval chant will surprise you more than a muted trumpet solo that sounds like it was taken straight out of a jazz record. The finale, “Slide,” again gives you only part of an idea of the exotic, wacky effects it contains. Speaking of effects, David Sampson finds creative ways to depict his city in Chicago Moves. The most creative of these is in the movement “Spaghetti Bowl,” which, for those of you unfamiliar, refers to a uniquely American type of highway interchange (here’s a photograph of Chicago’s). To capture this landscape, Sampson not only invokes car horns, he has each note of the main tune assigned to a different instrument, creating a frenzied, bewildering atmosphere not unlike being caught in a traffic jam. Our program’s encore is Copperwave by Joan Tower, the longest single track and the oldest composer, and the only piece not premiered by the Gaudete Brass. It might also be the least immediately approachable work, having been constructed in “waves” and not especially strong on the Latin American rhythms the booklet told me to expect. Cedille’s sound quality is exemplary and the acoustic well-proportioned, affording the Gaudete Brass a bit of room to create a rich, vivid sonority. They’re excellent players, and they’re to be commended for such a dedication to music. One hopes there is more to come, from many of these composers and from all five of these players.